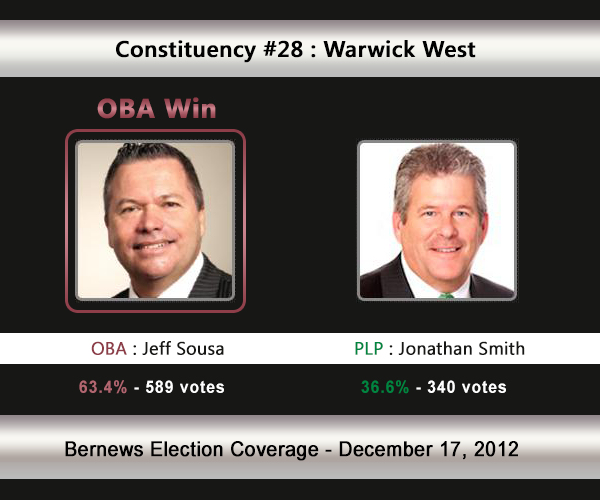 [UPDATE Dec 17: Election Results] Jeff Sousa [OBA] has defeated former Police Commissioner Jonathan Smith [PLP] in C#28 Warwick West. Mr Sousa — the owner of Sousa’s Landscaping — will be making his debut in the House. The PLP’s Jonathan Smith will match up against the OBA’s Jeff Sousa in Warwick West. The incumbent is the OBA’s Mark Pettingill who has moved to challenge the PLP’s Dale Butler in Constituency #25 Warwick North East. In 2007 Mr Pettingill [under the UBP] won 62.07% of the votes vs the PLP’s George Scott. In the 2003 General Election, Neville Darrell [UBP] won with 59.86% of the vote against Chris Furbert [PLP] who received 40.14%. 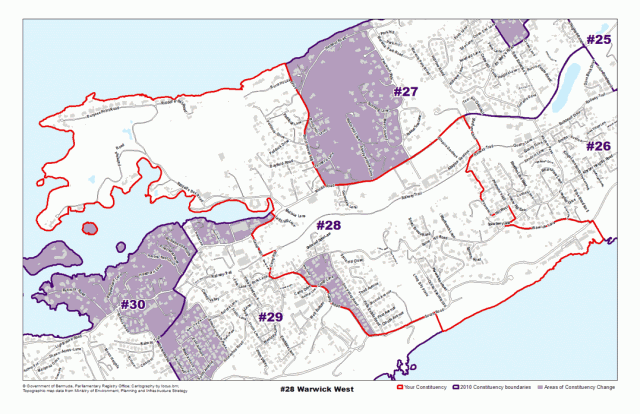 The areas the Warwick North East constituency consists of, or is located by, includes Camp Hill, Middle Road, Plumber Lane, Harbour Road, Tamarind Vale, Stadium Lane, Pearman’s Hill, Warwick Lane, Sun Valley Road, Spice Hill Road and more. Jonathan D. Smith OBE, CPM, BSc., DIP.CRIM served in the Bermuda Police Service for 27 years, five years as the Commissioner of Police, and is currently employed in the private sector. He was appointed a Government Senator in April 2011 and holds Junior Ministerial responsibilities for National Security, Transport, Government Estates and Information Services. Mr. Smith attended Warwick Academy and then Rossall School in the UK for his higher education. He trained at the Bramshill Staff College in Hampshire, UK, and the Canadian Police College in Ottawa, Canada. He holds a B.Sc. in Management from the University of Maryland and a Diploma in Criminology and Police Studies from the University of Cambridge, UK. He has considerable leadership, management and security-sector related experience. His extensive experience with intelligence, security services and law enforcement agencies were derived from relationships and training with the CIA, FBI DEA and London’s Metropolitan Police. His policing knowledge was sought after both here and overseas. He served as the co-chair of the joint UK-USA White Collar Crime Investigative Team based in Miami and as chairman of the Working Group for the UK Caribbean Overseas Territories. During his tenure as Commissioner, the Bermuda Police Force underwent five successive years of expansion, a successful inspection and, under his leadership, the first Police Support Units were created, Community Beat Officers were deployed for the first time; the first Operational Policing Strategy with a community ethos was implemented; as well as rapidly increasing firearms capability of the Service to meet a growing gang problem. Until Mr. Smith’s appointment as a Senator, he was a member of the Public Service Commission and the Defence Board and remains a Trustee of the National Sports Centre and member of the Board of Immigration. He joined the Progressive Labour Party in 2009 and has served as Chairman of the Research and Platform Committee. He published his first book “In the Hour of Victory” in 2011 and is currently working on another – a book on law enforcement – which is due for publication in 2013. An avid sportsman, he has played a number of competitive sports at club level and has represented Bermuda locally in slow pitch softball against US and Canadian teams. His dedication to youth and sports development saw him spend several years as a soccer referee in the BFA Mini-Minor and other youth leagues as well as baseball umpire at Little League level. At the age of sixteen, already armed with a deep respect for the island’s natural beauty, Jeff Sousa was afforded the opportunity to attend the Department of Agriculture & Fisheries Apprenticeship. It was this ‘hand-up’ that was instrumental in developing not only his passion for the environment, but in cementing his philosophy of giving back to the community. More determined than ever to position young Bermudians for success, the founder and president of Sousa’s Landscape Management Co., is currently the Chairman of the Occupational Advisory Committee for Horticulture where he has been a key player in developing the new Horticulture Apprenticeship Scheme. Jeff is also a mentor with the Bermuda Small Business Development Corporation’s “Partnering for Success” initiative. A family man with a deep respect for tradition, Jeff resides with his wife, Luan, in a home at the top of Burnt House Hill where his family has lived for the past 130 years. If you can’t find him there, he’ll be only a stone’s throw away at his garden centre, Sousa’s Gardens, a popular stopping point not only for the constituents of Warwick West, but for all residents of Bermuda. This is not to say, however, that Jeff spends all of his time at work, because his awards speak of a man firmly committed to his community. In addition to sitting on numerous government boards and committees, Jeff is a Past President of Hamilton Rotary, where he was honoured to receive The Paul Harris Award – one of Rotary’s highest awards for community work. He has received awards for community work from Purvis Primary School and the Southampton Seventh Day Adventist Church. A successful businessman, mentor and environmentalist, with a passion for helping the island’s youth, Jeff Sousa embodies vision of the OBA and he looks forward to representing the constituents of Warwick West.